Install the software, configure and reboot the PC. Automatic Loading: the Clarinet units connected to the PC are initialized by Clarinet Loader. Access to the Programs: to enter into the Clarinet applications by selecting the Clarinet program. Building a test: to use the assistant helping you to define a profile from templates. Running a test: to launch execution of profile for basic monitoring or simulation. Stopping a test: to stop execution of profile. Opening an event file: editing Events. Continuing to test suites... Getting Started with Clarinet-ETS. Clarinet-Help provides access to the Home Page of Clarinet-Help in HTML version. Clarinet-Init For allows advanced-users modifications of the initialisations of Clarinet applications. By default all the options are selected and filled with the regular values. Clarinet-Loader is the duplication of the shortcut which is in the Starting Group of Windows. For Reloading the software in some conditions. See Loader dialog. Read Me provides some additional information which could not be included in the Clarinet Help. At the end of the selection, the profile and the filter are saved in the directory selected under directory input (default is \Clarinet\Cladata). The Manager opens simultaneously a second windows for the Clarinet Protocol Event-Editor: the title displays the event-file name (*.ace) and the filter file name (*.acf). The Manager closes simultaneously the second windows of the Clarinet Protocol Event-Editor if the Event-Editor scrolling is ON. The Manager saves automatically the events in the event-file. 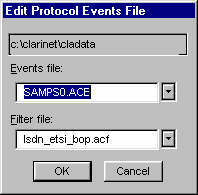 When the test is finished, the events can be edited off-line by use of Clarinet Event-Editor.The panel Edit Protocol Event file accessed by Events/Open Protocol or allows to specify the file names. The toolbar or navigation keys provides the way to move in the event-file. The edition is stopped by the File/Exit command. The Clarinet Help is provided under HTML format. The user should use Internet explorer to display the help pages about the Clarinet-system.